FARMINGTON — Soccer season and some weight room work had Mt. Blue junior Eli Yeaton physically prepared for Alpine skiing season. Some mental and technical adjustments he made during the season made him a complete, tough-to-beat package at the end of the season. Yeaton pushed himself through practice and a strong regular season to ski his best when it counted most, which earns him the Sun Journal All-Region Boys Alpine Skier of the Year. Yeaton skied well early in the season, Mt. Blue coach Mark Cyr said. But he was clearly still trying to make the transition from the fearless freshman with a constant need for speed to a more mature racer. Once he got the technique down, Yeaton found it was easier to once again make speed a priority. Fueled by the competition he had with teammates such as senior Sam Smith, Yeaton tried to go as fast as he could at practice. 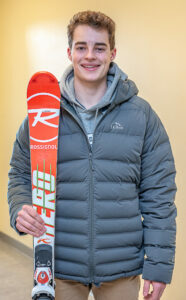 Yeaton started seeing his best results late in the season, including the KVAC championships, where he was runner-up in both slalom and giant slalom. Yeaton finished second in the giant slalom and third in the slalom at the Class A championships at Shawnee Peak. In the giant slalom, he closed the gap between him on eventual GS (and slalom) champion Sean Maguire of Marshwood by almost one second. The result provided more motivation for Yeaton for what could be a very promising senior season.